Light cavalry and light bow cavalry units may move one, two, three, or four hexes and battle. Barbarian chariot units may move one, two, or three hexes and battle. Barbarian chariot units are classed as Light mounted units for the purposes of being ordered to move and taking hits. 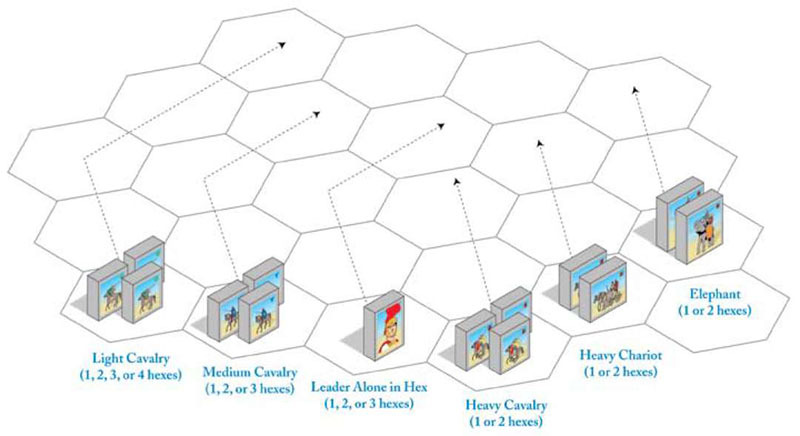 Medium cavalry units may move one, two, or three hexes and battle. Camel and cataphracted camel units may move one, two, or three hexes and battle. All Camel units are classed as Medium mounted units for the purposes of being ordered to move and taking hits. Heavy cavalry and heavy cataphracted cavalry units may move one or two hexes and battle. Elephant units may move one or two hexes and battle. Elephant units are classed as Heavy mounted units for the purposes of being ordered to move and taking hits. Heavy chariot units may move one or two hexes and battle. Heavy chariot units are classed as Heavy mounted units for the purposes of being ordered to move and taking hits. The example above shows the movement rates of mounted units and leaders. All the units in the example (except the leader by himself) may battle after moving their full movement rate. A leader may move one, two, or three hexes when moving alone. A leader moving alone may move through hexes occupied by friendly units and leaders, but cannot end movement in a hex already occupied by another friendly leader. A leader may not move onto or through a hex occupied by an enemy unit or enemy leader except to attempt escape. A leader may only be ordered to move once per turn. A leader that is ordered does not have to move (unless attached to an ordered unit that is moved). Ordered leaders may move from one section of the battlefield into another section. A leader may never move off the short sides of a battlefield or the long sides of the battlefield, top or bottom, unless allowed by Battle Special Rules. Exception: Leader Evade and Escape. Only one leader may occupy a hex (however moving through a hex is not considered occupying that hex). A leader in the same hex with a friendly unit at the start of the player's turn is said to be "attached" to the unit. If the unit is ordered to move, the attached leader must move with it to the same hex. Note that only one order is required to order a unit with an attached leader. When a Section Command card, the Order Mounted Troops or the I am Spartacus Command card is played, a leader in the same hex as a unit may be ordered to detach from the unit and move by himself. Section cards, the Order Mounted Troops Command card and the I am Spartacus card have a helmet symbol to remind players that one or more attached leaders may be ordered to move separately when playing these cards. Each attached leader detached from its unit and moved separately costs one order. The remaining orders on the Command card may be used to order units (including the one from which a leader was detached), or unattached leaders. Note that a leader may not detach from a unit when a 'Leadership' Command card is played. An ordered leader may detach from one unit that has not yet moved, and then move and attach to another unit. When a leader moves onto a hex with another unit, the unit he attaches to is not automatically ordered. The newly attached leader may not move with the unit he has just joined, and even if the unit itself has been ordered, it can now move no further (it can still battle however). Timing is important when detaching and attaching leaders. Once an ordered unit with an attached leader moves, the attached leader cannot be ordered to detach. Once a moving leader attaches to a new unit, the new unit may not move if ordered, but the unit (and its attached leader) may Battle in place. As an example, the owning player selects an Order Three Units Center Command card and orders a heavy infantry unit, its attached leader and a heavy cavalry unit in the center section. The heavy cavalry unit is moved first and moves adjacent to an enemy unit. The attached leader moves second, detaches from the heavy infantry unit, and moves onto the hex with the heavy cavalry unit where the leader ceases movement and attaches to this unit. Had the heavy Infantry unit moved second, the attached leader would have been required to move with it and could not detach after moving. The heavy infantry unit moves third. The ordered heavy cavalry unit and attached leader may now battle. The ordered heavy infantry unit could battle if adjacent to an enemy unit.